Please make it to your nearest polling station today, and encourage your friends and neighbors to vote too! We stand at the crossroads in this city's history. So this election is vitally important. As a rule I don't make election promises. However, there are some things I CAN promise because I know I can deliver. I promise I will give you positive leadership. I promise I will give you progressive , honest, and ethical governance. I promise I will look to fully engage the public in our governance processes. We want a council that is competent and governs with a good heart and integrity. To do this it is vitally important that we ALL VOTE in this election. Moreover, it is important that you use your influence to have your friends and neighbours vote. WE MUST BECOME THE CHANGE THAT WE SEEK IN THIS WORLD. Watch the video of the event. You will be inspired. I certainly was. What a great event it turned out to be. Friday November 11, 2011, I will be placing a wreath at the cenotaph at White Rock City Hall on behalf of the Equitas Society that represents the disabled veterans of Afghanistan. Democracy would not exist without their sacrifice. COME ONE COME ALL TO THE WHITE ROCK PIER THIS SUNDAY TO SUPPORT OUR MAYORAL CANDIDATE WAYNE BALDWIN. All citizens of White Rock are called to join us as a show of support for our Mayoral Candidate Wayne Baldwin. Bring your friends, bring your neighbours and join in on the fun. Coffee will be provided by FIVE DOORS DOWN. We will also have a board to sign and these names will be published in the PEACE ARCH NEWS and serve as endorsement for Wayne in his bid to be elected as Mayor of White Rock. At approximately 3 pm a photographer will take our picture on the pier under the White Rock sign. What a fantastic event this will be. We look forward to seeing you there - RAIN OR SHINE!!!!!! In his bid for the Mayoral seat in White Rock BC, Wayne Baldwin today announced his next policy statement, which is aimed at outlining and clarifying his views and strategies on specific issues. Enjoy! “It is imperative that going forward we do all we can to make White Rock as green and sustainable as possible for Generations to come”. “We are blessed to live in one of the most beautiful places on earth and I want to make sure my 9 Grandchildren can walk barefoot in the surf with their Grandchildren on White Rock beach”. “It’s really about making a firm and abiding commitment from a point forward, that all that we do and how we do it will be looked at through a green and sustainable perspective." Wayne believes that we need to look hard everyday, in everything we do where we can make the small changes that add up to big changes in the environment. From green energy audits and advanced recycling programs at City Hall to changing the way we look at how our actions effect our environment, how we conduct our city operations and how our community can be more sustainable overall. “Large green initiatives can be expensive and onerous, but if we make small differences each day in the way we do things and in cases where we can make a big difference we can be successful – it is all about balance”. Wayne knows from experience how to get things done at City Hall while beautifying and sustaining our community for the long term. In his bid for the Mayoral seat in White Rock, BC, Wayne Baldwin today announced his first of several policy statements, which are aimed to outline and clarify his views and strategies on specific issues. When it comes to economic development, Wayne feels that the City of White Rock actually has an excellent Economic Development Strategic Plan in place. He feels the City has been slow at getting the plan into action and wants to change that. The final Economic Development Strategic Plan was Produced by VannStruth and accepted by the City of White Rock in May of 2009 at a cost of over $38,500. The City was also just presented with another new consultant’s report, the Coriolis Report, at a cost of $40,000 to $50,000, that basically reinforces the recommendations in the 2009 plan, which was accepted 2 years earlier as policy. Wayne believes that the recommendations in the Consultants reports are smart, practical and are ready to be put into action. “We walk a fine line in the City of White Rock not to over develop and risk changing the substance of our unique community character, but we cannot ignore any opportunities to attract new business and create a vibrant economy”. “We need to create a solid infrastructure which will support a sustainable City by the Sea”. Wayne knows from experience how to get things done at City Hall. The 2009 Economic Development Strategic Plan can be seen here. And the Coriolis Report can be found under October 19 meeting agenda here. 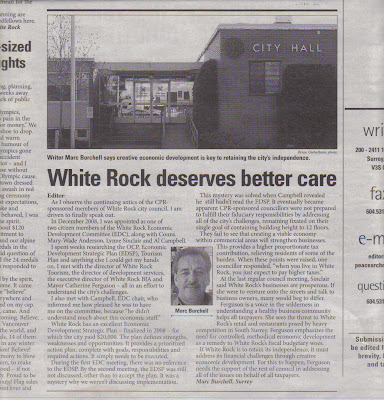 In a recent letter to the editor of the Peace Arch News, Marc Burchell, citizen-member of the White Rock Economic Development Committee (EDC) since 2008, outlines why White Rock needs better care and better leadership if it hopes to remain strong and independent into the future. Read the full article from the Peace Arch News online.